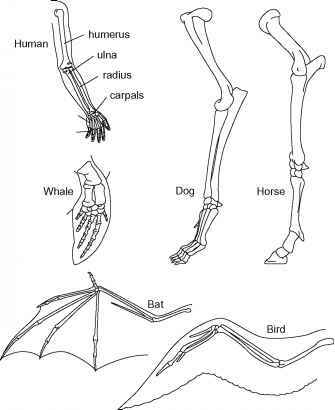 Figure 2.1 The human arm and the forelimbs of a whale, dog, horse, and bat are homologies because they all evolved from a common ancestral tetrapod. However, the wings of bats and birds are considered analogies because they did not evolve for flight from a common flying ancestor. Instead they evolved flight adaptations independently and their anatomy shows it: bat digits spread apart skin to catch lift and birds create the same effect without a bony infrastructure, just with their feathers. Illustration by Jeff Dixon. different functions for manipulation, swimming, running, and flying (Figure 2.1). These structural similarities, or homologies, are due to their common, albeit distant mammalian ancestry and persist despite the evolution of different functions that change them through time. Conversely, the wings of bats and birds represent analogies. Despite their similar function, the structures are not equivalent. Bat wings evolved from ordinary quadrupedal mammalian forelimbs and feathered bird wings evolved from bipedal dinosaur forelimbs. The similar functions evolved independently in what is called convergent evolution, or adaptive convergence, and they do not indicate recent relatedness or inheritance from a common ancestor. Bird legs and human legs are another example: both permit the animal to walk bipedally, but their foot anatomy is arranged completely differently. In many birds, the first toe (and sometimes the second one as well) points backwards for balance and grasping ability, but the big toe of a human sticks out in front with the others. Animals with similar structures are more closely related despite seemingly vast differences in the modification and use of those structures (e.g., bats and humans) than many animals with similar functions are (e.g., bats and birds).